The countdown to the Hell's Vengeance Adventure Path begins today, as we reveal the first of six iconic villains that will appear in Paizo's first Adventure Path for evil characters! We start with the iconic evil cleric, Lazzero Dalvera. 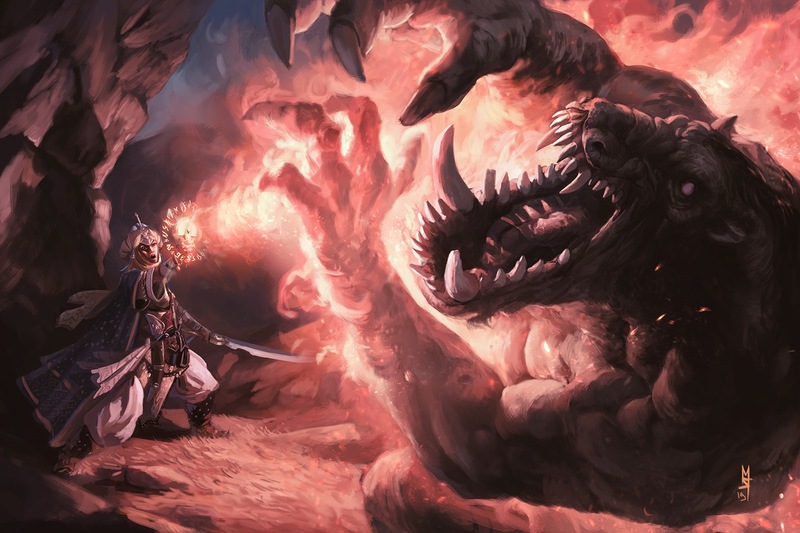 Check out Pathfinder Adventure Path #103: The Hellfire Compact for Lazzero's full stat block, and keep an eye out for the upcoming Hell's Vengeance Player's Guide, which will contain all of the new iconic villains for use as pregenerated characters! Lazzero Dalvera, the eldest child of an officer in the Molthuni army and a priest of Abadar, was born under an auspicious moon with a full head of bright red hair. Everyone assumed he would earn respect and fame as an army officer like his mother. His training began as soon as he could walk, and he attended the best military academies to which his parents' money and connections could win him entrance. But the boy was not a strong child, and he lacked the temperament to hone his martial skills. Instead, bullies perfected their own abilities at his expense, both in formal sparring matches and between classes. Rather than retaliate with violence, Lazzero kept tabs on the children who picked on him, recording their secret transgressions—cheating, lying, petty theft, and other such behaviors common among privileged youth. When he had amassed a sufficient amount of dirt on his rivals, he ensured his teachers found it—anonymously of course—and laughed to himself as the bullies got their just rewards for their wrongdoings. Despite his skill at countering his rivals, Lazzero still didn't excel in his martial studies, and by the age of 12 had washed out of every military academy in which his parents had placed him. With their hopes in their son dashed, they sent Lazzero to be trained by the Abadaran clergy, who counted his father among their number; if he couldn't fulfill his destiny as a military commander, he would do so in service to the Master of the First Vault. In this endeavor Lazzero finally succeeded, for he found prayer and contemplation came naturally to him. Now among the top initiates in the Abadaran monastery, Lazzero took on the role of bully and tormentor. He didn't need to study as much as his less studious peers did, and could use the time not spent poring over religious texts making life harder for those weaker than himself. In addition to overt hazing, Lazzero maintained even more thorough records of his enemies' activities, which he took pride in turning over to his superiors—publicly this time—so that they would receive punishment for their transgressions. While he couldn't ensure that justice was served, Lazzero believed he was doing Abadar's work. How, he asked, could his peers expect to teach Abadar's ways if they couldn't themselves follow his laws? Was he not complicit in their wrongdoing if he allowed their crimes to go unpunished? With such justifications, Lazzero convinced himself that what he did was right, that it would set him apart from his so-called equals in the eyes of his teachers and Abadar. He didn't recognize, however, that he had started down a slippery slope that would ultimately lead to his fall from grace—for Lazzero had begun to twist the law to meet his needs. The law was now a weapon he used to keep those he didn't like beneath him. By graduation, Lazzero had distinguished himself as one of the most gifted acolytes, though he had made no friends and garnered his share of enemies, many of his teachers among them. For his apprenticeship, Lazzero traveled from Canorate to Cettigne—an inglorious posting not befitting his high marks and honors. Lazzero was to serve as the acolyte at the local temple along with a fellow graduate, a woman named Laureth. The pair were highly competitive, each aspiring to rise in the ranks of the church quickly and find a permanent placement in a more prestigious temple than Cettigne's. 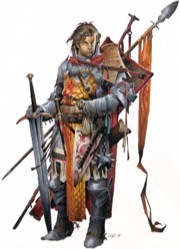 Although Lazzero was the more talented cleric, Laureth was more favored, receiving a prominent position within the temple and taking on greater responsibilities. Unwilling to accept a position beneath his rival, Lazzero began plotting and spying on Laureth in the hope of catching her falling short of the high standards expected of Abadar's clergy. Laureth provided him no opportunities, however, behaving as a paragon whom all faithful of Abadar should aspire to emulate. Frustrated and bitter, Lazzero prayed for a means of turning the law against Laureth, but Abadar provided no guidance. Rather, a different voice echoed in the recesses of Lazzero's mind, offering honeyed promises of providing all Lazzero could imagine and more. It spoke of deceptions and lies as a means to an end, of the weak serving the strong, and of always having the upper hand. Lazzero liked these words, and though he knew he would no longer be true to Abadar if he were to follow them, he did so anyway. He would see Laureth humiliated, no matter the cost. Prompted by his mysterious new divine patron, Lazzero began committing minor crimes himself and staging evidence to point toward Laureth. Fabricated trade records for transactions under her jurisdiction, false testimony written in her hand, and unbalanced ledgers month after month with no explanation into the shortfall all built a case against his rival. Through subterfuge and sabotage, Lazzero ensured that Laureth could never be solvent in the eyes of Abadar's code. Best of all, he brought about her ruin through the very laws and regulations that had for so long kept him from achieving his own lofty goals. When Laureth was convicted and sentenced to a life of servitude rather than clerical service, Lazzero said a prayer of thanks to the Keeper of the First Vault, asking for a blessing from his patron. Asmodeus answered in his stead, revealing himself to have been the orchestrator of Lazzero's revenge upon Laureth. In that moment, Lazzero knew that the path to his prophesied glory lay not in continuing in his father's footsteps in the temple of Abadar. The Prince of Lies had shown him the power of deceit and the means through which he could always ensure the law worked in his favor. That night, Lazzero left Cettigne, his vestments and holy symbol left folded neatly on his modest cot, and headed south to Cheliax. He forsook all his Abadaran vows and proclaimed his faith in Asmodeus, and sought a church of his new patron. No longer did Lazzero worry that he would not achieve greatness. He was content to enter an Asmodean temple as a lowly adept with faith that his dedication would quickly raise him to the upper echelons of the church. Thus did Lazzero begin his true journey—a quest for power and glory achieved by following the Prince of Darkness. For the next month or so, every Tuesday we are going to be digging into some of the new rules and options you will find in Ultimate Magic, which is due to release in May. This week, we'll take a look at some of the new archetypes that take up a full 32 pages of this 256 page tome. One of the first things you will notice about this book is that the new classes from the Advanced Player's Guide receive archetypes in this book (except the cavalier, who does not use magic). Here is an example of a new alchemist archetype, the vivisectionist. A vivisectionist studies bodies to better understand their function. Unlike a chirurgeon, a vivisectionist's goals are not related to healing, but rather to experimentation and knowledge that most people would consider evil. A vivisectionist has the following class features. Sneak Attack: At 1st level, a vivisectionist gains the sneak attack ability as a rogue of the same level. 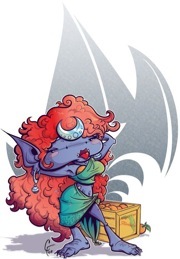 If a character already has sneak attack from another class, the levels from the classes that grant sneak attack stack to determine the effective rogue level for the sneak attack's extra damage dice (so an alchemist 1/rogue 1 has a +1d6 sneak attack like a 2nd-level rogue, an alchemist 2/rogue 1 has a +2d6 sneak attack like a 3rd-level rogue, and so on). This ability replaces bomb. Torturer's Eye: At 2nd level, a vivisectionist adds deathwatch to his formula book as a 1st-level extract. Cruel Anatomist: At 3rd level, a vivisectionist may use his Knowledge (nature) skill bonus in place of his Heal skill bonus. Torturous Transformation: At 7th level, a vivisectionist adds anthropomorphic animal to his formula book as a 2nd-level extract. When he uses this extract, he injects it into an animal as part of a 2-hour surgical procedure. By using multiple doses of this extract as part of the surgery, he multiplies the duration by the number of extracts used. At 9th level, a vivisectionist adds awaken and baleful polymorph to his formula book as 3rd-level extracts. When he uses the awaken and baleful polymorph extract, he injects it into the target (not a plant) as part of a 24-hour surgical procedure. He can make anthropomorphic animal permanent on a creature by spending 7,500 gp. At 15th level, a vivisectionist adds regenerate to his formula book as a 5th-level extract. Bleeding Attack: A vivisectionist may select the bleeding attack rogue talent in place of a discovery. Crippling Strike: At 10th level or later, a vivisectionist may select the crippling strike rogue talent in place of a discovery. Discoveries: The following discoveries complement the vivisectionist archetype: alchemical simulacrum*, concentrate poison, doppelganger simulacrum*, feral mutagen, parasitic twin*, plague bomb*, poison bomb, preserve organs*, sticky bomb, tentacle*, tumor familiar*, vestigial arm*, and wings*. Of course, the classes from the Core Rulebook receive a number of new archetypes as well. 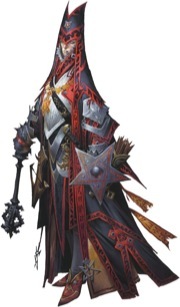 Take a look at the Undead Lord archetype for the cleric. A cleric cannot take the undead lord archetype unless her deity's portfolio includes the Death domain or a similar domain that promotes undeath. An undead lord has the following class features. 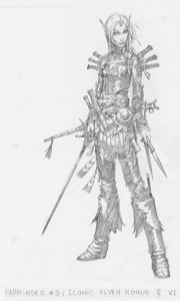 Death Magic: An undead lord must select the Death domain (and the Undead subdomain from the Advanced Player's Guide, if available in the campaign). She does not gain a second domain. In all other respects, this works like and replaces the standard cleric's domain ability. 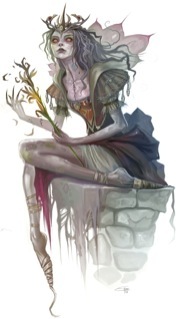 Corpse Companion (Su): With a ritual requiring 8 hours, an undead lord can animate a single skeleton or zombie whose Hit Dice do not exceed her cleric level. This corpse companion automatically follows her commands and does not need to be controlled by her. She cannot have more than one corpse companion at a time. It does not count against the number of Hit Dice of undead controlled by other methods. She can use this ability to create a variant skeleton such as a bloody or burning skeleton, but its Hit Dice cannot exceed half her cleric level. She can dismiss her companion as a standard action, which destroys it. Bonus Feats: All undead lords gain Command Undead as a bonus feat. In addition, at 10th level, she may select one of the following as a bonus feat: Channel Smite, Extra Channel, Improved Channel, Quick Channel, Skeleton Summoner*, Undead Master*. Unlife Healer (Su): At 8th level, the undead lord's spells, spell-like abilities, and supernatural abilities used to heal undead heal an extra 50% damage. At 16th level, these effects automatically heal the maximum possible damage for the effect + the extra 50%. This does not stack with abilities or feats such as Empower Spell or Maximize Spell. Well, that about wraps up this week. Next week, we will take a look at the magus. Before I go, here is one last bit to get you excited for this book. A complete list of all the archtypes found in Ultimate Magic (except for those sneaky magus archetypes, I'll save those for next week). Each one of these classes has other rules bits associated with them as well, but we will talk about those in a future blog. Enjoy. Alchemist: The chirurgeon, clone master, internal alchemist, mindchemist, preservationist, psychonaut, reanimator, and vivisectionist archetypes. Bard: The animal speaker, celebrity, demagogue, dirge bard, geisha, songhealer, and sound striker archetypes. 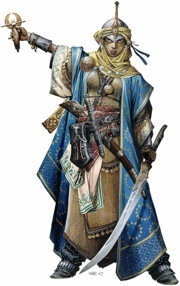 Cleric: The cloistered cleric, separatist, theologian, and undead lord cleric archetypes. Druid: The dragon shaman, menhir savant, mooncaller, pack lord, reincarnated druid, saurian shaman, shark shaman, and storm druid archetypes. Inquisitor: The exorcist, heretic, infiltrator, preacher, and sin eater archetypes. Monk: The high-fantasy qinggong monk archetype. Oracle: The dual-cursed oracle, enlightened philosopher, planar oracle, possessed oracle, seer, and stargazer archetypes. Paladin: This section presents the oathbound paladin archetype. Ranger: The magic trap using trapper archetype. Sorcerer: The crossblooded and wildblooded archetypes. Summoner: The broodmaster, evolutionist, master summoner, and synthesist archetypes. Witch: The beast-bonded, gravewalker, hedge witch, and sea witch archetypes. Wizard: The metal elementalist and wood elementalist wizard schools and the scrollmaster wizard archetype. Golarion Day: Subdomains for Everyone! The Advanced Player's Guide introduced a new concept for clerics—subdomains. It then went on to list subdomains available for the core 20 deities. Which is fine and good, if you happen to worship one of those deities. But what if you worship Besmara? Or Zura? Or the Lost Prince? Or Ymeri? This post answers those questions. Listed below are the subdomains available for all of the other deities who are mentioned by name in the upcoming Inner Sea World Guide. 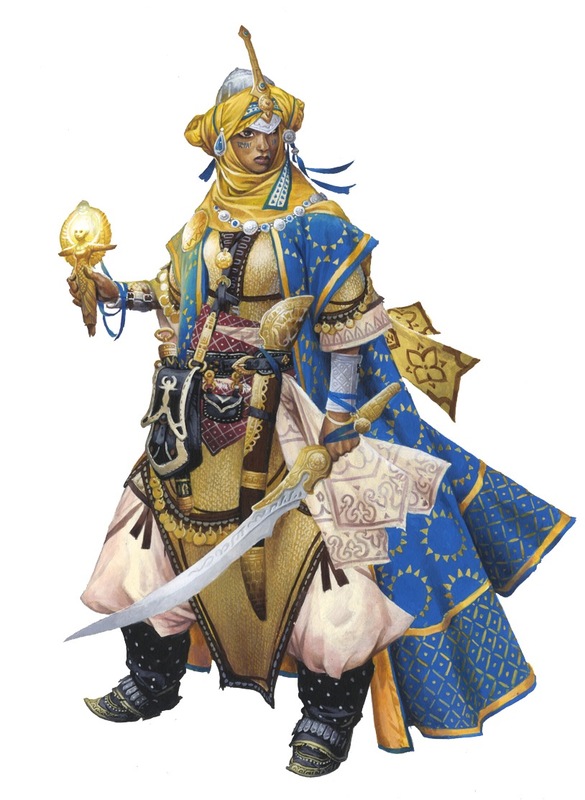 Keen-eyed scholars of Golarion lore will note that there are even more deities beyond the ones I'm listing below, but in an attempt to keep this blog post from getting too huge, I'm limiting it to JUST the additional deities we mention in The Inner Sea World Guide. That way this post also serves as a sort of stealth preview for that book! If there's another deity from another book who you JUST HAVE to know the subdomains for, post a request in this blog's messageboard section below and I'll answer them as I get the chance. *Although this subdomain would normally not be available to worshipers of this deity, in this case an exception is made due to the deity's close association with this theme. Oh... hmm. Art. Yeah. 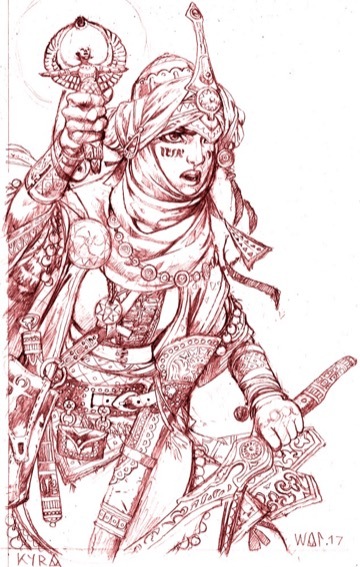 Ummm... since this blog post is something of a preview of The Inner Sea World Guide, and since she was once a demigod herself (although not anymore; she lost that status when she died and got turned into a lich), here's Arazni, the Harlot Queen of Geb! Roubris held the broken longsword in both hands, his mouth agape as it spoke to him. "It took you long enough, Roubris." Roubris heard the sword's voice in his head, like how the moon at midnight would sound if it could speak. "How do you know my name?" Roubris was no stranger to talking weapons, but this was the first time one seemed to know more about what was going on than he did. "I've been watching you. You've been traipsing all over this battlefield rescuing the dead souls of those trapped in the weapons they wielded. Well, I'm just such a soul." The tarnished sword had been designed for a warrior with large hands. If it were whole, Roubris would likely have had difficulty lifting it, but most of the blade was missing. Even though the sword's voice was only in his head, Roubris spoke aloud. "What's your name?" "And you know your situation? You remember the battle?" This was all very odd. For the first time, Roubris's prepared speech about how the spirit of one that falls in battle is sometimes trapped in a weapon that has slain a foe held no importance. Serth already knew all about that. He knew he was trapped in the sword, and that Roubris's special talents could help him. "Well, I can arrange to have you sent to your proper afterlife, Serth. I can assure that you get your just reward." "And what do you need in return, young Roubris?" Serth's tone suggested to Roubris that he knew very well what was needed. "Serth, how do you know so much? Trapped spirits so rarely do." In fact, they never did. "Is that really important? You're here to get me to tell you some secret that will earn you a handful of gold coins. Payment for services rendered, correct? Isn't that really the issue here?" In fact, it was. Roubris was unnerved, but ultimately he was not a particularly curious man. Despite the fact that he dealt with the supernatural on a routine basis, he really didn't care about the nature of spirits or the afterlife beyond what he needed to ply his trade. He had never even questioned the source of his special ability. Was it necromantic magic? Some psychic gift passed down from a distant ancestor? A blessing from the gods? A curse? Were the spirits even there at all until he came along, or did his ability somehow summon them back? It didn't matter. All that concerned him was that it worked and that he got paid for using it. "All right, Serth. You know the routine. Do you have something for me that will cover my expenses? Restoring a trapped soul isn't an easy business. It doesn't come cheaply." "Ah, there's the Roubris Chor I was expecting. Excellent." Serth's slick, dark voice continued on in Roubris's mind. "My friend, I value my destiny very highly. I am eager to escape my unfortunate imprisonment here. So much so that I am willing to tell you about a treasure hoard well beyond the half-full coin pouches you used to get. What value to me are such things now?" "A temple treasury, my friend. I don't know the exact value, but it is surely the equivalent of tens of thousands of gold coins, as sure as I'm talking to you now. It's some distance away, but I'll guide you." "Were you a priest when you were alive, Serth?" "Something like that. Rest assured that the temple with this treasure has been sitting empty for quite some time. No one there will prevent your entry." "You wouldn't lie to me, would you, Serth?" Spirits trapped in the weapons he found rarely tried to deceive him. Too much lay at stake to risk it. But there was something about Serth's voice, his all-too-ready and all-too-knowledgeable demeanor. Every warning bell in Roubris's head was ringing with a loud peal. "What value would there be in lying to you? If you get no payment, I am denied my freedom, right? I value that liberty more than you can know, Roubris. I am willing to pay highly for it. Besides, the temple treasury is what I have to offer. Even if I wanted to offer you something less, I could not. Either way, it hardly matters to me in this form. My concerns are now far less terrestrial." True, thought Roubris. Serth's grasp of the situation certainly seemed logical and straightforward. He likely had a great deal of time to dwell on it. In the end, this was all quite refreshing compared to the coercion and convincing Roubris typically had to do when speaking with a spirit in a discarded weapon. And if the treasure hoard was even half what Serth claimed... If it was even a quarter or a tenth, it was still the greatest payment he had gained for the rescue of a single soul. "Well, Serth, why don't you tell me where we need to go?" Roubris carried Serth through the busy city streets wrapped in burlap. People passed by him carrying baskets of fresh bread loaves, sacks of flour, or other items purchased in the nearby market. No one paid him any attention, which was just fine by him. Even the lovelier ladies that he saw did not prompt him to stop and chat, as would normally be his way. Well, the sight of one young woman with sparkling green eyes did encourage him to stop, bow, and smile, but when she ignored him he did not pursue the matter. "No one is truly selfless, but Karatha comes close." When Roubris reached the steps of the temple of Iomedae, he straightened his tunic and brushed the dust from his pants and boots. When he opened the door he paused, reverently, and then walked silently inside. The weapon throbbed in his hands, but he heard nothing. Karatha walked up to him, wiping her hands on a rag. She wore an atypical smock covered in brightly colored stains. She'd clearly been painting something. "Roubris, how good to see you. Another weapon already?" Roubris spoke quietly. "Yes. Can we put it in the sacred storage area, like we normally do?" Karatha furrowed her brow. There was no such area, and it was nothing they normally did. Roubris raised his eyebrows and motioned his head slightly to the right. Karatha, wise as ever, caught at least a portion of his meaning. "Yes, of course." The two of them walked to a small vestibule where Roubris placed the wrapped sword on a bench. Then the two of them left that area and went back into the main chapel, Roubris closing the door behind them. "What's going on?" Karatha asked. "I wanted to talk to you, and I didn't want the sword to overhear." "Coming from anyone else, those would sound like the words of a madman," Karatha said with a smirk. Roubris rolled his eyes and gave a wry smile. "Seriously," he told her, "this weapon is different. It's smart. It knows things." "You mean the spirit trapped inside is smart and knows things." "Yes, yes. Whatever. You know what I mean." "What kinds of things does it know?" "When I found it, it knew its situation, which is usually not the case. Plus, it knew that I'd be looking for it, and what you and I could offer it." Roubris rubbed his chin. "Yes, I suppose so. But it's also a bit unnerving. I don't like it when things are out of the ordinary." Karatha nodded. "I understand. Well, let's see about sending the soul to its proper afterlife, and then it won't matter anymore." "Well, we can't. Not yet." "He hasn't led me to my... reward yet. It's a long journey, apparently, and he has to guide me." Karatha just nodded and stared, not asking the obvious question: then why was he here? "The treasure is apparently in an old abandoned temple. I don't know much about such things, Karatha. I was wondering if you would accompany me. Or rather, us. I'd feel safer. I could make a special donation to your church on your behalf once we find the gold to compensate you for your time and trouble." Karatha smiled warmly. "Very generous of you, Roubris. But what temple is this? How far away is it?" Roubris realized then that it never occurred to him to even ask what god or gods the temple represented. "I'm not exactly sure. I'll try to get the details." "Well, obviously, I cannot consider defiling the temple of any of the gods of light or justice in any way, nor could I in good conscience allow you to do so either. And I couldn't be gone from my duties here for more than, say, two weeks." Roubris nodded. He hoped that Serth wasn't going to lead him to such a temple, either. That would be awkward. "I'm led to understand that the temple is abandoned." "All right. I understand. I'll find out." "Please do. Once we know, I'll accompany you if I can. Some time on the road could offer us a good opportunity to talk in depth." Karatha would want to work on him, attempting to get him to see the ways of Iomedae. She was always encouraging him to think about concepts like justice and honor. It's not that he could see no value in such things, just that rigid definitions of either or both sometimes became... inconvenient. Still, talking with her about such things wasn't really all that arduous. She wasn't overbearing about it. And even if she was, it would be a small price to pay for her aid. Roubris was worried—those warning bells were still tolling in his head. So, however, was the sound of tens of thousands of gold pieces jangling as they cascaded all around him like some beautiful rain shower. Roubris thanked his friend and fetched Serth. He removed the burlap wrap and held the sword by the pommel. He didn't speak aloud, but kept the conversation entirely in his mind. "Serth?" "What?" The oily voice sounded annoyed. "The temple where the treasure is—whose temple is it?" "It's important. I can't steal from the temple of a benevolent deity." "You won't be stealing from anyone. The temple is long abandoned." Roubris sighed. "I know. But before that, what god was the temple's patron?" "No 'benevolent deity' to be sure. That should be enough for you." It was. "And how far away is it? We have only a couple of weeks or so." "That should be fine if you procure some decent horses." Roubris nodded. Serth was in a foul mood. He found the voice in his head unpleasant. "Thanks, my friend. We'll hopefully make it quick and get you to where you're going." The first day's travel north took them into a land of rolling hills and isolated copses as they headed toward towering, snow-capped peaks. The horses Karatha procured had been expensive, but even Roubris's untrained eye could see that they were of quality. The day's ride was quiet and the roads lonely, which they agreed was for the best. Neither Roubris nor Karatha was thrilled to ride into the unruly land of Ustalav with its feuding nobles and the dangers of the Hungry Mountains looming above and ahead of them. After a brief stay in a public house found at a crossroads, they continued on. They proceeded through narrow mountain passes and rocky ravines, over majestic hilltops and down deep gullies, always keeping to the road. The days grew dark. On the third day a storm steeped on the horizon. By that evening, it plagued them with wind and rain. Even after they coped with its torments and it passed them by, the sky remained overcast and grim, as if scarred by the storm. Serth remained tucked into Roubris's saddle, silent. Karatha asked Roubris a few questions now and again about how he felt when he helped the trapped spirits. He told her he didn't do it for the feeling, he did it for the payment. "People who do good deeds because it makes them feel better about themselves just display a different kind of selfishness," he told her on the fifth day of their journey. "Even if they're not doing it for money, they're doing it to get something they want." She nodded, then countered. "That might be a consequence, but it's not always the motivation. Some do good and spread justice for its own sake." Roubris chuckled. "That might be what they say, but people can't truly be selfless. There's no such thing as selflessness. It's right there in the word. If you're a 'self' you can't be selfless. It doesn't even make sense. No one does anything that doesn't benefit them in some way. It just doesn't make sense." Before she could respond, the dark morning sky filled with angry shrieking and the dull fluttering of large wings. Roubris looked up to see a horrific creature looming above them on batlike wings of flesh. It was like a worm, and like a slug, and yet like neither. Multiple mouths screamed promises of destruction. Multiple eyes glared with malevolent intent. There was nowhere to run. No time to escape. Coming Next Week: Monstrous battles and philosophical quandaries in Chapter Three of Monte Cook's "The Ghosts of Broken Blades." As one of the primary architects of the third edition of Dungeons & Dragons, Dark Matter, the d20 Call of Cthulhu system, and Monte Cook's World of Darkness, as well as the author of such notable supplements as Arcana Unearthed, The Book of Eldritch Might, Dead Gods, and more, Monte Cook has left an indelible mark on the history of fantasy gaming. In addition, he has published two novels, Of Aged Angels and The Glass Prison, and his short fiction has been featured in such venues as Amazing Stories and Game Trade Magazine. For more information, visit montecook.com. .
An Alchemist and a Priest of Cayden Cailean recline at the banquet. A Cleric of Asmodeus, Paladin of Iomedae, and a Barbarian warrior wait for the APG Preview banquet. Cave raptors are sated; it's time to blog! There's a peculiar quality to the Florida swamps. Bear with me here, because this story does eventually come around to science fiction. More than a few feet down, the swamps and bogs of central and southern Florida are just acidic enough and just the right temperature to kill bacteria without destroying delicate tissue. This means that anything organic buried in the swamps (and keep in mind, swamps account for roughly 119% of Florida's land mass) is pickled and preserved for hundreds of years. While in college studying anthropology, I assisted on a dig (more of a 'bail,' really) in one of these swamps. We were excavating the remains of an indigenous Calusa settlement. Our professor uncovered an amazing find: an intact human skull over 1,000 years old. He gathered us all around, brushed away the mud, and raised the skull dramatically. With a nauseating schlorp, something fell out of the foramen magnum: a one-thousand year old human brain. And that fascinated me: everything this late-adolescent male experienced, every skill he'd learned... It all laid there as a jellied grey-brown puddle in the mud. And it would have remained intact for even longer if we hadn't clumsily stumbled across it and suffered from our Indiana Jones fantasies. Ancient history always fascinated me, but seeing that brain in the mud felt almost like meeting a time-traveler. Since then, the idea of meeting people from the past has fascinated me. It must be a common fascination, because that's what the science fiction classic The Ship of Ishtar covers in incredible detail. The setup is classic: Contemporary John Kenton discovers an artifact that hurls him sideways into a strange new world; but this premise is worth mentioning because A. Merritt's The Ship of Ishtar (written in 1924) is one of the earliest stories to use that device that became such a staple in later pulp. After his arrival, Kenton proceeds to beat up, ally with, or seduce everything on board a magical ship cursed by the Babylonian gods six millennia ago. Merritt narrates with both fists as Kenton interacts with an entire crew who remember a real-world culture long since vanished. Abraham Merritt's writing style is complex and conversational, more a dramatic old man recounting the story to his grandkids between slugs of whiskey than a piece of literature. His love of exclamation points is almost poetic, and provided a host of new things that my roommates and I now yell at each other from opposite ends of the house. Probably not the most academic endorsement, but it certainly proves The Ship of Ishtar's entertainment chops. So, in lieu of reconstituting the battered and filthy remnants of a long-dead Calusa's brains, now so much jello mold, I think I'll continue to sate my need for historical contact with fiction. Preferably of the pulp variety. Seriously, it was disgusting. You should've been there! Seen—brains! The votes for the First Annual Gen Con Pathfinder Cosplay Contest are in, and after a hard battle, the winner is... both of them! Yes, it seems that our messageboard horde saw too much merit in Tiffany's fantastic starknife and Kelly's unnerving Pactmaster mask to let either of them go unrewarded. (And in a way, Tiffany started this whole idea with her costume last year, so perhaps we should consider this the 2008 and 2009 awards.) Regardless of how you parse it, the result is that both Kelly and Tiffany will be receiving $50 in Paizo store credit. Congratulations to them both, and special thanks to messageboard poster Taig who offered to foot the bill for the second prize—we may not have taken him up on it, but we always love seeing the generosity of our community. As for all of you who didn't have time to compete this year: there's always time to start preparing for next year's contest! Time to start collecting those giant crab legs for your Rovagug suit, hitting the gym in preparation for the Merisiel outfit, or shaving the family dog and training it to carry your goblins—I mean "beautiful children"—on its back. The possibilities are endless! Cosplay Contest Part Deux: Choose Your Champion! Despite the relatively late warning (next year's contestants: consider this your starting gun), we doubled our Pathfinder cosplay turnout this year. That's right: two intrepid individuals spent portions of their con wandering around in full Pathfinder regalia, forever winning our hearts (and potentially $50 dollars in store credit). This year's contestants were Tiffany as a cleric of Desna (whose same costume last year inspired the contest, and hence is allowed to compete this year as well—unfortunately, only last year's photo is available) and new challenger Kelly, who wowed us all with his incredible rendition of a Pactmaster of Katapesh. Which costume is the best, and most deserving of reward? It's a tough question, but it's up to you to decide. If you want to weigh in on the matter, or just congratulate them both on their amazing costumes, head over to the Pathfinder Cosplay Contest thread on our messageboards and make your voice heard. Votes will be collected for roughly 48 hours, at which point we'll announce the winner here on the blog. So what are you waiting for? Let the voting begin!